FleurDanielle: A MASSIVE THANK YOU!! I decided to come onto my blog to type up my next post only to see I now have 50 followers! There are 50 of you reading my blog and that makes me so very happy. I never thought I would get 5 followers let alone 50 so thank you so so much. As everyone knows there are hundreds of beauty bloggers out there and it is very hard to get noticed so I appreciate you all taking the time and effort to come on to my blog whether it is to read or just to leave a comment below my post I appreciate everything. Reading blogs before starting my blog has taught me everything from photography and getting the right sort of lighting to how to get noticed to not forcing my blog on people to learning and being inspired by different aspects of the blogging world. In a nutshell blogging has definitely become one of my favorite things to do and I am seriously so incredibly happy that my own little corner of the internet is having a positive reaction. Knowing that you are from all corners of the world is such an interesting thing for me to see so thank you so very much. I have now decided that I will be blogging every Monday, Wednesday and Friday starting from next week. I have 2 more posts coming up in the next couple of days and then from next week a proper blogging routine will start. Once again thank you all so much and if you have ideas for posts or want to see reviews on any of the products mentioned in any of my posts please feel free to leave a comment. 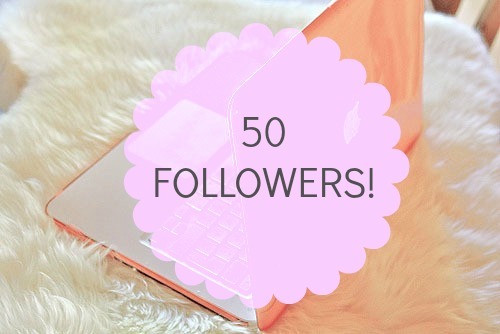 Following your lovely blog now :)so you now have 51! congrats! I know the feeling, I never thought I would have one follower!